Salad bars at Laredo Schools are always colorful, clean and well-stocked with an array of fruits, veggies and even proteins like tuna salad (in lower right-hand corner next to the lettuce). A district with near universal free/reduced status shows poverty is no bar to hankering for healthy, fresh fruits and veggies. Roberto Cuellar knows the Laredo Independent School District in Texas like a native. That’s because he is. Cuellar not only sees the school meal program at Laredo ISD as the person in charge—he’s director of child nutrition services—but also as a customer because he went to Laredo schools growing up. “It gives me goosebumps visiting some of the schools, especially J.C. Martin Elementary, the one I attended—that’s one I really want to get a salad bar!” he laughs. Salad bars are very big in Laredo ISD since Cuellar introduced them several years ago. In fact, they have been so successful that Laredo won the Produce Excellence in Foodservice award last year in the K-12 school category from the United Fresh Produce Association. 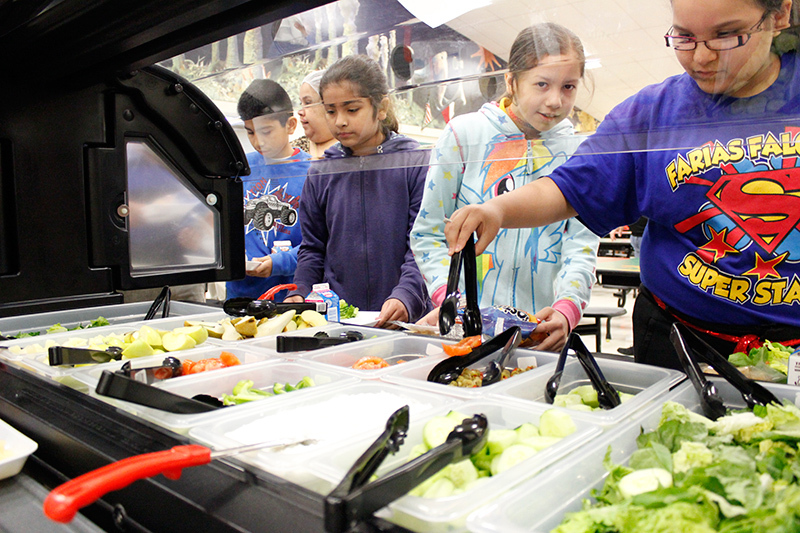 All middle and high schools, as well as six of the 20 elementary sites, in Laredo have salad bars, and the goal is to have one in every school. Cuellar got an indication of the openness of Laredo student to salad bars from his menu advisory committees, which have student representation from all district schools, and from his annual Food Expo Extravaganzas, where students taste test potential new menu items for the coming year. “Through these student-driven committees, salad bars came into play because they were asking for more ways to spice up the vegetables in the menus,” Cuellar recalls. Currently, all middle and high schools, as well as six of the 20 elementary sites, have salad bars. The bars have not only fruits and vegetables but proteins like chicken, cheese sticks, tuna salad and cottage cheese. Having variety is critical, Cuellar maintains. He says certain staples like cucumbers and carrots will always be available, but other items vary, even to the point of putting something like half a tuna salad sandwich on the bar once a week as the protein option. Cuellar also has a goal of putting some sort of exotic vegetable item such as spaghetti zucchini or tri-colored carrots on the salad bars twice a month beginning this spring. New or exotic items are always promoted with signage, posters and mentions on the monthly menu calendar. 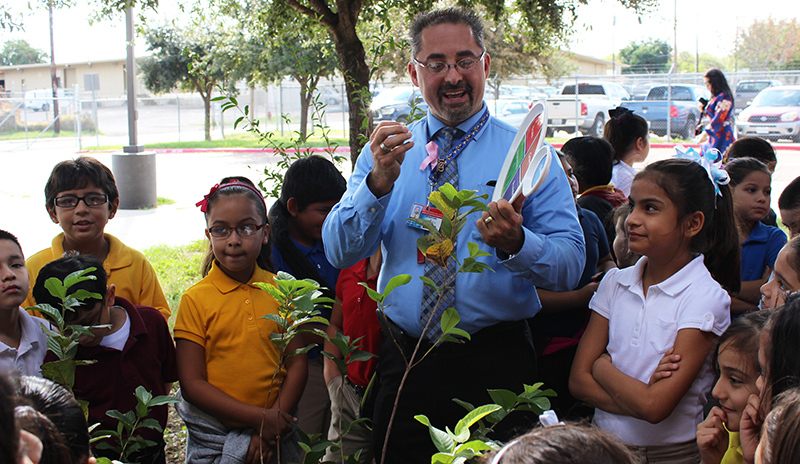 Nutrition Service Director Roberto Cuellar is passionate about promoting fresh, healthy foods in the high-poverty district where himself went to school as a child. Cuellar also pays attention to how his salad bars are organized. For example, protein items always go toward the front (once, when he tried placing it at the end, student lined up at that end as a matter of habit, he recalls). Color is also a significant consideration. “We mix it up a bit, making sure our salad bars are colorful because color makes a big difference in everybody’s eyes,” Cuellar says, adding that there has to be a variety of hues. “You can’t have all green, it just won’t work,” he observes. Fruits especially help add color but some shades, such as brown and white, just tend to be turnoffs, at least on their own, he adds. He cites white asparagus as an example, noting that he once taste tested it with his own son at home and while the child did somewhat reluctantly eat it, he has doubts that a white vegetable will draw much interest in his cafeterias. Maintenance and replenishment are carefully addressed with runners who are stationed at the bars to keep them tidy and to refill bins during serving periods. Promotion of his cafeteria salad bars can get pretty creative. In the elementary schools, there’s a mascot called Henry the Health Charger, “superhero of salad bars.” Henry is there every time a school rolls out a salad bar to help introduce it to kids and to tout its benefits and its appeal. It seems to be working: Cuellar proudly notes that vegetable consumption tends to double shortly after a salad bar debuts at a school. Promotion even extends to the department trucks that deliver product from the warehouse to the school sites. Truck wraps proclaim slogans about the department’s nutrition message, especially about its emphasis on fresh produce and the salad bars. Elementary schools tend to get the bulk of the promotional effort to push salad bars because they offer a chance to mold taste for young palates before lasting habits are formed. At the secondary school sites, there is a little more latitude for individual choice, but the salad bars are always there and presented as attractively and temptingly as possible. They are one of several choices—all very healthy—in the high schools, where a food court-style service format also includes options like a deli line, a Mexican line and an international line. Cuellar estimates on average about a quarter to a third of high school lunch participants utilize the salad bar either as the primary choice or for a side to an entrée from one of the other stations. The salad bar selections are closely monitored to reflect student preferences. One good way Cuellar says he found to ensure continued interest from his young customers is to listen to the student advisory committee suggestions and follow through with adding those items if feasible because then the advisory committee members can then act as ambassadors to promote the newly added item to their peers. “If you give them a sense of belonging, a feeling that they are listened to, it makes a big difference,” Cuellar offers. With more than 98 percent of the district’s 24,000 students qualifying for free or reduced-price school meals under federal guidelines, Laredo ISD is a completely Community Eligibility Provision (CEP) program where all students get free school meals. Cuellar has been the district foodservice director for the past seven years after starting with Laredo ISD a dozen years ago as a menu planner.